I recently realised that I had got into a bad cycle of procrastination when it came to painting miniatures. And I blame it all on you. The blogosphere is great for our hobby but it does rather raise the bar on quality. No doubt you lovely people like to come here to look at all my shiny toys and I thank you all for your kind praise. I can also tell you that working in an environment saturated with amazing paint jobs reinforces the feeling that only the best is good enough. I had a moment of realisation when I caught myself thinking that I couldn't possibly find time to paint a faction for Shadespire. Now, at its best that's only three miniatures (I'm looking at you here, Mr Steelheart). Which is pretty lame on my part. So I decided to just shut up and do it. The solution was simple; to regard the time invested as a more important part of the equation. The faster I can paint the more I would see that as a 'win' on a par with quality. I've previously mentioned Mark Bedford's painting tips. I plundered these mercilessly when it came to Garrek and Chums. Start over a black undercoat, then zenith red spray followed by airbrushing the skin blue then white. Garrek and Chums after the spray and airbrush stages. Block in the details, a few highlights and washes on selected areas and then lots of BLOOD! Most notably, beyond the spraying and airbrushing I didn't do any further highlights to the flesh or cloth. Creating a little stand so your minis can sit over a radiator is a good tip too just to shorten drying times. Everyone has their own rust technique and mine is: wash Skrag Brown thinned with lots of Lahmian Medium over a black basecoat, then drybrush with Ironbreaker and then sponge-on Stormhost Silver. Pretty quick but really effective. Most importantly I found I really enjoyed painting Garrek and Chums. The sense of achievement at seeing these guys go from plastic to done in one weekend was really rewarding. I feel like I can 'crack on' with quite a few projects that have been sitting around. The 'shut up and do it' philosophy only goes so far when one's ability to paint is fathoms below the time it might take to build the miniature in the first place. I have to admit that my hobby procrastination has been terrible recently and my blog has really suffered for it. I've sporadically updated instagram, but written nothing on my blog in an age. Your Reavers look very nice, I really need to try cultivate a "shut up and do it" mentality. Or as a post I've seen around arty blogs on the net "Finished, not perfect." As in, get your work finished, don't try to make it perfect. It's a crying shame, I want to see more ! I will be getting back to it JB, I do have a few ideas that I want to write about. Enjoying what we do is the most important aspect since it's a hobby. I know seeing what people do fuels me and my motivation, it gives me plenty of ideas, some great, some not so great. As long as I keep doing stuff and enjoying it I don't mind. I also get satisfaction from people coming up with great ideas I didn't have, makes me think "cool, someone's done it". 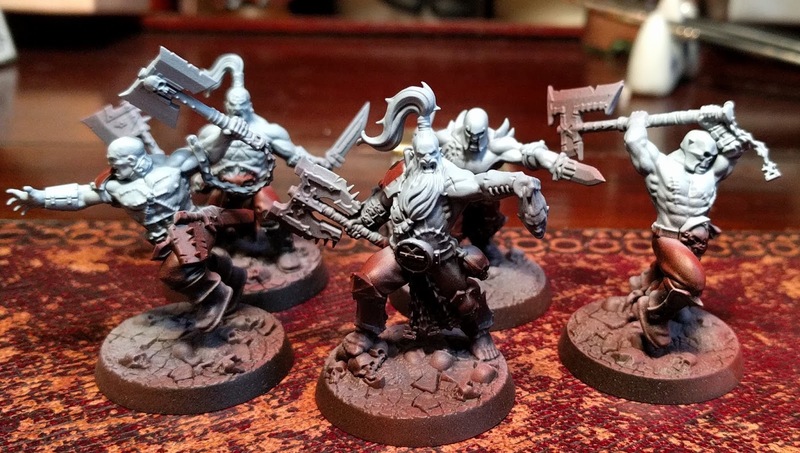 Anyway, your reavers looks great and I just happen to be working on mine as well ! Nice work and a sentiment we can all learn from! I agree. Apart from starting a blog, two things that have really helped me paint have been: (1) stopping painting things that are a chore and (2) stopping trying to copy Golden Demon models and concentrating on techniques to make my own painting slightly better, as opposed to making it perfect in one fell swoop. I've definitely improved (still not amazing but what the heck) and I've enjoyed painting a lot more. 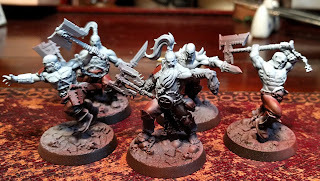 Anyway, these guys look cool and I like the technique you've used on the flesh. Great figures, and the bluish skin will help them stand out nicely. Interestingly, I like the white skin stage as well, might be a good place to stop if doing some sort of pallid cave dwellers. I find that there has to be a balance between "get it done" and "do it well", as sometimes you just need to crack on and paint those five more standard space marines, and sometimes you need to linger over a character or other special piece. Finding time to do it at all can be hard though! Looking good! Shut and do it is good advice. I really need to follow it.